Amaranthe has been on the rise since their inception in 2008, having established a unique sound and direction within heavy metal music. But it’s also something that has taken a lot of work for them to accomplish, in terms of releasing new material and near-constant global touring. 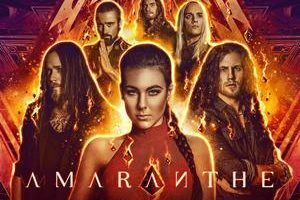 These things begin to take more of a toll as bands grow older, and Amaranthe was no exception to this. They had lost growler Andreas Solveström after The Nexus, but the loss of clean vocalist Jake E proved to be a much greater challenge and stress on the band. But with due diligence, the band found Nils Molin, of Dynazty, as Amaranthe’s newest member and we now sit at the cusp of the release of their fifth album Helix. 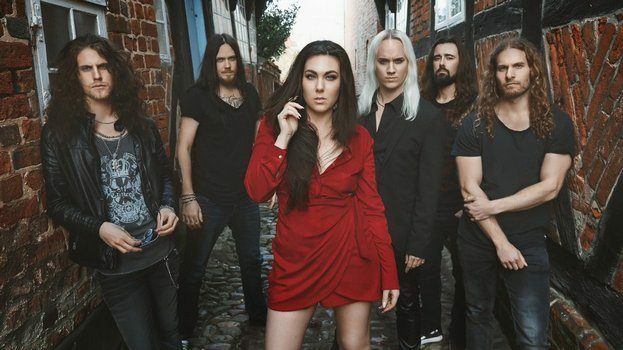 Able to look at what they have accomplished to date, they set out on returning to what components define Amaranthe as a band, and what each member uniquely contributes. The result is an album that takes the most experimental parts of Maximalism and blends them with the core of the band itself. In short, something just as genre-defying and masterfully written as anything else they’ve accomplished. Sitting down for a Skype chat with vocalist Elize Ryd, whom this scribe has had the honor and pleasure of chatting with on multiple occasions, the opportunity arose to go a bit deeper than the norm. Some talk of Helix ensues, but there’s also some honest talk about the stresses of finding a new vocalist, Ryd’s thoughts about Avicii’s suicide and how changes are needed within the industry, having a ‘metal family,’ and what keeps her positivity radiating from day to day. Dead Rhetoric: 2017 was a tough year with Jake [E] leaving and the search for a replacement looming. Do you feel that the band is in a good spot with Nils [Molin] now? Elize Ryd: I do feel that we are in a good spot, thank you for asking. Usually you don’t want to make a big buzz about changing members in a band, but it’s much more work for the remaining members than you could imagine. It was very stressful, I must admit. The remaining members are the ones who have to take care for the future and I was very dedicated to the situation we ended up. We found Nils, who is from Stockholm and he is such a nice guy, who is very humble and an amazing vocalist, so it all turned out good in the end. Dead Rhetoric: Do you feel that stress lead to the creation of a heavier album? Ryd: Absolutely, to be honest. We didn’t hold anything back. It was a perfect opportunity. This type of stress had been in our lives for a few years. Maybe since the end of 2015. From my perspective, I’m a very expressive person and it’s not easy to express yourself in society. There are very few places where you can go and really loosen up, and that’s what music means to me personally. It’s where I can really express myself and get my emotions out. Listening back to Helix, I can hear that there was a lot of stress being released, but also from a positive perspective, we knew that we had found a new member and that everything was going to be fine again, so it was also a very positive process as a band. Music is the best way for me to express myself. I always felt that it was the only way for me to free myself from these different states and emotions. I could always connect with music, and not so much with other things except dancing. That was also a way to express myself through my body. I love that. I think when I listen back to Helix now I can hear a lot of positive energy. It seems like we are happy again [laughs]. During the songwriting process, there was nothing to be ashamed about, and there was nothing that we needed to hide. You don’t have to hide away from yourself or others – there’s no reason to do that. Everyone has their own issues, it could be anything. Breaking up from a long-time relationship, that’s what it’s like to divorce from a previous [band] member. You get emotions from that which need to be expressed. Dead Rhetoric: Being that the name of the album is Helix, what is the DNA of Amaranthe? What makes you all up as a band? Ryd: I think that the DNA of Amaranthe is that we have very, very talented musicians in the band. I have always been very focused on developing my stage performance and get confidence in my own skin. To feel like I can be proud of my work and get better at my songwriting. Even if you are a small group of people working together, you have this goal in common and dreams you want to achieve. Your passion is music, and even though we are one unit, there are six different personalities within this concept. We have been active for 10 years now. We can only compare ourselves to our previous work, and our last album was Maximalism. We felt it was very experimental from our perspective. Olof [Mörck] got very deep into making the digital [sound] for the keys. Back in the day, we used samples, which is the easiest way to use keys. Everybody can go into this program and find these sounds. Samples are an easy way to do that. He felt that this part of our sound needed to be developed, so he was watching YouTube all day. He learned a lot from DJs, like Avicii, who created his own sounds. Based on the loops, you can use specific sounds to make your own. So that’s what we focused on with Maximalism. We dropped that knowledge into this album, and at the same time, we realized that we did not focus on the core of Amaranthe [last time]. The core is still that we are passionate about our original instruments. For Olof, that’s the guitar. We have Johan [Andreassen] who is more of a punk bassist, and we have Morten [Løwe Sørensen], who is one of my favorite drummers. It’s weird to say since we are in the same band, but I love drums. When I was a kid, my wish was to become a drummer. I’m not sure if I’ve said it before, but I wanted to be a drummer. I wanted to buy a drum kit but my parents told me that our neighbors were not going to like it so I couldn’t get it. So I cried and I cried, and then I thought about what else I could do with music, and singing was part of my everyday life. But drums are one of my favorite instruments. Morten is capable of doing anything on the drums. I think that we actually focused a lot on the whole band this time. We needed to really give each member a chance to shine, and not focus so much on the digital stuff. It’s been interesting for us, because that’s a big part of Amaranthe as well. We developed it on the previous effort, so we brought in that concept but focused on each person’s instrument as well. That is the core of Amaranthe. The passion for each person’s instrument and how talented they are at that instrument. That’s what we wanted to focus on. The same with Henrik [Englund Wilhemsson] and his growls. He is amazing and can do so many things. Each member got their own space on this album – we kept the individual’s core and brought them together to create Helix. Dead Rhetoric: You were pretty outspoken on Instagram about Avicii’s suicide, which makes sense given your own personal history. How do you feel things should change in the industry to alleviate some of those stresses on touring bands? Ryd: This is a very interesting subject, because I know the problems and I’ve seen it with my own eyes. I know it’s very hard for people on the outside, like fans for example, to realize the truth. I totally respect that. This industry is very small, compared to some other industries. Today I actually went to a workshop in the musician’s union. I grew up having idols and role models. Avicii was one of the role models who inspired Olof to develop the digital part of the Amaranthe sound. Like I was saying before, he had gone on YouTube to learn how to make his own samples, and Avicii was the one who was doing that. He’s also from Sweden, so it’s very close for us. I realized that I have been in this life for around 30 years now and I’ve seen so many artists go down. It doesn’t make sense anymore. It doesn’t make sense to me that artistic people are the problem. We are just human like everyone else. We have the same passion as music as the fans do. Then I realized that it doesn’t have anything to do with the type of person, because in the past, people judged musicians for being irresponsible and they had to do this kind of job because they wanted attention or they accepted lifestyle and they sacrificed themselves as human beings to be in the industry. That is actually a lie. It’s not the truth at all. For us, being the musicians, it’s the same decisions in what profession that we choose. That is what I really became passionate about it. We have a profession just as everyone else has a profession. Why is it that we as musicians usually end up having health issues? I realized that we do not have the kind of protection that other industries usually have. We don’t have somebody telling us that we are only allowed to work 8 hours straight. Actually, the rule in Sweden is that you can only work 5 hours, and then you need a break in order to continue. But 8 hours is the maximum amount of time that your body can handle to do a job. For musicians, because you choose to be a musician, all these rules disappear. No one is there to protect you. No one is telling you that you have been working 10 hours straight and you need a break: you need to relax and get your rest. We do not usually get rest, naturally, because being on the road is very tough on your body. You need nutrition, you need to work out, you need a social life. You need to around the people that you love and support you – somewhere you feel comfortable. The band becomes your family, of course, but it’s not naturally the decision you would make. In other professions, you wouldn’t go home with your colleagues and sleep in the same room. It’s not natural [laughs]. For one single person, Avicii for example, he was alone. He was surrounded by people who did not share the same passion. He only went on the road with people that were hired by management, who were sitting in an office making the schedule, and they had to spend all their time together. He was the person that everyone relied on. So there’s a lot of pressure that’s not normal. It’s not human to be the only person who matters. Everybody’s work relies on you – if you get sick you ruin other people’s lives, by cancelling a show for example. The other guys are going to be effected by that. The whole situation of being an artist is really weird. So I decided to join the musician’s unions and educated myself. There are actually rules, but most musicians don’t know about them. You need to create an environment where people can get the same level of relaxation and circumstances. You need those to be able to live and feel healthy and be normal. I am very, very, very passionate about it because I know how damaged people can be. You feel guilty for making a decision and becoming a musician, then you feel obligated to accept all the bad things. You get used. A lot of people take your income, because they feel they are the reason that you were able to fulfill your dreams. That’s also not the case in other professions. Nobody comes to you being like, “It’s because of me that you became a lawyer. You have to give me 50% of your income because you wouldn’t be able to do that without me.” It’s kind of fucked up to be honest. I will try to do the best that I can for other musicians. You have to respect your choice of profession. The music industry in general needs to be changed, in many ways. I really hope we are going towards a better time regarding that. Self-signed artists, I think it’s a good way. Then you don’t need to rely on other people. We, as musicians, don’t feel like we need help from other people, but somehow other people have taken advantage of the industry. So it’s positive that you can release your own music on Spotify, you can be independent, you can be DIY, and it’s a good way. Hopefully it can become even better. I don’t think people should develop psychological/health issues because everyone else is basing their survival on you, as a human being. Dead Rhetoric: Going in an entirely different direction, what do you look for when you plan your next tour outfit? I know at this point you have people sending you outfits as well. Ryd: This is funny – I just sent money to my friend so that she can buy me a jacket, which is really metal, that I want to use on the next tour [laughs]. I love to change my outfits, I get easily bored, and sometimes people ask why I change them so much, but I can tell you, they get sweaty! You don’t travel around with a washer and dryer. I do not like to use the same clothes for a month, especially on stage [laughs]! It’s funny because people don’t think about that. We are on the road, we are not home – we cannot do laundry, so we have to just change the clothes. I always try to look at comfortable clothing – something that’s not too warm, and something I can move in and kick my legs and feel free. That is what matters the most: comfortable fabric, and something that’s not too warm. Dead Rhetoric: Could you talk about the friendships that a number of female metal musicians, such as yourself, have developed. You are good friends with people like Simone [Simons] and Alissa [White-Gluz]; I see it as almost like a metal family of sorts. Ryd: You are so right on that. I think you can compare being in the music industry to being in a small group of people. If you lived in a city and you loved a specific kind of workout or interest or passion – you share it with only a handful of people. No matter how big the city is, you would be related to these people sooner or later. You would probably be closer to these people than you are to your own family, because you share the same interest. I think that’s the kind of comparison when it comes to me and the other female artists in the industry. We are the minority, and when you meet these people, you realize how similar we are and how we share the same passion, and we dared to stand out. That’s what makes our relationship very strong. It’s something that you can’t deny in any way. I have old friends that I don’t have the time to hang out with that I really, really love but my relationship with Alissa, for example, I love her. I feel that she’s one of my favorite people on Earth. The same goes with Simone. We have even shared going on tour together, which brings you even closer. I know how they feel in their profession, so we can share those kind of emotions with each other, which I can’t share with any other person on the Earth at the moment. That’s why we get so close to each other as friends. You are so right when you say that it’s family. We are family – it’s like sisters from other misters [laughs]! But it’s incredible. I think that’s one of the reasons that you realize how small the world is. Alissa is from Canada, Simone is from the Netherlands but lives in Germany, and I had the honor of working with Tarja [Turunen] and of course I immediately clicked with her. The same goes with Floor [Jansen]. We may have different approaches, but we share the same scene. It’s so tiny! We are all from different places but we come together well, and I really appreciate being able to keep in contact. For other people who are not in the scene, and may wish to be, we are family regardless of who comes in. We are not competitive. We want to invite every person. If there is a female who wants to start a band, we are the people that they should turn to. We will receive them with open arms. It’s a very incredible bond that we have created. Of course, the same goes for the men in this business. They are so similar to each other – it’s like a bunch of friends. Regardless of who you tour with, you get a long great in the end.